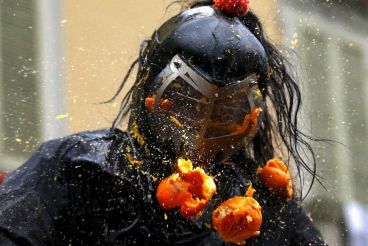 The Carnival in Ivrea (that is situated in the neighborhood of Turin) is famous for the Battle of Oranges. This is the most large-scale gastronomic event in Italy. In 2017, the Battle of the Oranges in Ivrea will start on Sunday, February 26th. The Carnival traditionally ends on the Shrove Tuesday, before Lent. This year it will be on 28 February. The three-day battle will bring together nine teams and tens thousands of spectators. During these three days, the players will destroy more than 500 tons of oranges! This battle symbolizes the freedom of the inhabitants of the town of Ivrea and the near arrival of spring. The history of the battle of oranges is associated with the medieval urban legend. In that time, a local nobleman, owner of these lands, decided that he has a right to spend the first night with all the girls of Ivrea. But the miller's daughter, in order to protect herself, beheaded an evil ruler and victoriously put his head on public display. But the carnival battles also have more modern explanation. In the 20th century when girls of Ivrea wanted to attract gentlemen, they threw fruit in their direction, and they reciprocated. After World War II apples were used for this purpose, but later they were replaced by oranges. We may assume that the orange color is associated with freedom. Place: Ivrea (Turin, Piedmont). The road from Turin will take no more than one hour, if you take taxi – half an hour. Cost: you can observe the event for free, but a team player (foreigner) must pay about 100 euros. It is a fun, lively, but also potentially traumatic event. This is why, you must be prepared for it, especially if it is your first time. Viewers who do not mind being hit by the orange, should wear red and orange hats. Also, they should wear shoes, in which they can run on the wet streets. It is forbidden to throw oranges at viewers, although it is allowed to lure them in the team. In Northern Italy, where Ivrea is situated, not many oranges are grown. They are brought here from Sicily. The Carnival ends with the a so-called "solemn requiem." There you can hear the symbolic final phrase of the carnival: "See you next Shrove Tuesday, at one o'clock." During the closing of the carnival a huge straw pole is set on fire. It symbolizes the future bright and happy life .